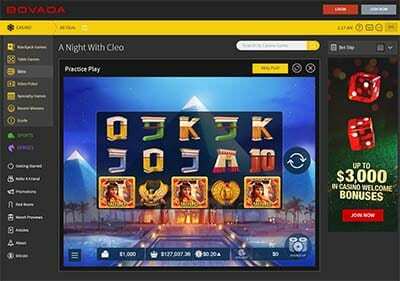 Bovada.lv is an online and mobile USD casino site aimed at players from North America and one of the most popular gambling websites in the United States. Whether you love to bet on racing or sports, or love taking a spin on the online slots in their casino section, Bovada is highly recommended for players from the USA. It's also an instant-play, no-download casino, meaning all players can play their games on desktop computers or mobile devices without the need to download any special software. All new registered players at Bovada get a generous welcome bonus offer depending on which part of the site (casino, poker, racing/sport) you decide to play at. For Bovada Casino, the sign-up bonus for new players is a whopping $3,000, granting everybody a massive amount of extra credits to enjoy Bovada’s selection of 300+ online slots and table games. There are also two other welcome bonuses relevant for casino players, which they can also use to maximise their starting casino account balance. 1. $3000 Bovada Casino welcome bonus: Spread out across three matched deposits, deposit up to $1000 each time using the bonus code ‘NEWWELCOME’ in the banking/cashier section for the maximum possible bonus amount of $3000. 2. $5000 Bitcoin match bonus: For players who deposit using Bitcoin digital cryptocurrency, there is a 150% match bonus up to the value of $1,500 which can be redeemed up to three times for a maximum starting bonus of $5000, using the bonus code ‘BVCBITCOIN150’ while depositing at Bovada Casino. 3. Refer-a-Friend: Send a friend a referral link and if they click it, join and make a deposit, Bovada credits 200% of their deposit to your account, up to $100 USD. Compared to other casinos the editorial team frequents, the welcome package and additional bonuses are quite generous, and if depositing the maximum amount to earn the highest possible matched bonus on your deposits, can kick off your Bovada betting account with a healthy starting balance to really enjoy their games – perfect for high-stakes players. Note: Bovada Casino’s welcome bonus and bitcoin match bonus has a 25X wagering requirement before the deposit, bonus amount and any winnings can be withdrawn successfully. Bovada has additional bonuses, promotions and one-off offers for members to take advantage of and rake in additional cash to play with. Some are great value, but others not so much. All in all in our experience we found the site put a lot more effort into their promotions than many other competitors specifically targeting the North American market. Casino Benefits– Bovada’s regular loyalty rewards program which grants points on every bet you make. 100 points equals $1 in casino bonuses at Bovada, which is automatically credited to your account. Different types of games award varying levels of points – slots grant 3 points for every $10 bet, while table games may only grant 2 points for every $10 wager. Mobile Bovada Casino bonus: Wager $250 or more on your first time playing at Bovada.lv’s mobile casino site and get $10 credited to your account. Not the greatest promotion to encourage portable gaming at Bovada, but something nonetheless. Red Room – Bovada.lv’s VIP program which grants regular players and high rollers personalised customer service support, cash rewards, exclusive offers, expedited payouts and additional weekly match deposits whenever you fund your casino account, and higher maximum deposit limits. Bovada.lv has over 300 real money online slots and table games on offer for USA players. Their software selection isn’t as strong as some competitors, with only three mid-tier gaming developers making up their total catalogue: Bodog Custom (proprietary games software), Real Time Gaming and Rival Gaming. There’s a decent amount of variety to be found among the extensive slots titles and popular and niche table games selection, and most players will be satisfied with whats available – just none of the usual big names or live dealer, unfortunately, but this is mostly due to licensing issues as to what gaming software American-based players can legally be provided. Bovada hosts games in the following categories: Blackjack Games, Table Games, Slots, Video Poker, Speciality Games. Current software developers hosted at Bovada Casino: Bodog Custom (proprietary), Real Time Gaming and Rival Gaming. Blackjack: There are 8 blackjack games currently at Bovada Casino, including Classic, Double Deck, Single Deck and Perfect Pairs. Roulette: Just 3 measly roulette games, including two variations of single-zero European little wheel. Online slots: Over 200 slots to choose from and made by Bodog Custom, RTG and Rival, including 3D, three-reel, five-reel, progressives, i-Slots, video slots and the Real-Series, with standouts including A Night With Cleo, Aztec’s Treasure, Goblin’s Gold, Soccer Babes, Super Diamond Mine and Ten Times Wins. Other table games and speciality titles: There are over 40 other games rounding out the Bovada software catalogue, including bingo, craps, Carribean Stud, keno, let’em ride, rummy, Sudoku and scratch cards. Video Poker: There are 17 video poker games to Bovada, including Deuces Wild, Jacks or Better and Joker Poker variants. A neat feature of Bovada Casino is the ‘Recent Winners’ section, which lists all of the most recent winning players and which game they won money on, including the exact amount they withdrew as winnings and the date of their win – definitely a good motivator to earn some of your own luck online. It’s a cool social addition and we’d like to see more of it from Bovada.lv going forward. Bovada.lv also has fully comprehensive sports betting markets for those who love to have a punt on all major sports, including college sports, cricket, esports, NBA, NFL, MLB, NHL, novelties, racing, rugby, soccer, tennis, UFC. Read our more in-depth Bovada online sportsbook review here. Bovada is licensed and regulated by the Kahnawake Gaming Commission, a well known and trusted advanced gaming jurisdiction located in Mohawk Territory, Canada and is audited by third-party gaming software and technology regulator iTech Labs. While the information is freely available off-site, Bovada tends to be extremely obscure about displaying this information and this is one area we feel they need to improve upon for both existing and new players – more transparency to guarantee peace-of-mind for players. Bovada.lv is a great online casino choice for North American USD players with decent bonuses, promotions, VIP rewards and customer service – it just doesn’t have some staple casino game software from big-names like Microgaming and Net Entertainment that we’re used to, but that’s because of region-specific licensing issues. The absence of live dealer games is definitely noticeable given the majority of online casinos in 2017 heavily push live gaming, and is hopefully an area Bovada can work on in the near future. New players can sign up at Bovada online and mobile casino via our links to claim up their $3000 sign up bonus on their first three deposits.